Brown turkey. Add remaining ingredients and stir thoroughly. Cover and cook over low to medium heat for 45 minutes, stirring occasionally. Serve with sour cream and chives if desired. Friends have been saying that they cannot add themselves as followers nor can they add comments…so I’ve been slacking lately…however, I think I might have the “follow this blog” issue resolved…on the upper left corner of your address bar there should be a “follow this blog” link….click on that…please let me know if you still are having problems…now trying to work on why comments cannot be left…grrrr…THANKS! Today I am going to show you what to do with all that basil that has been growing so beautifully in your gardens. 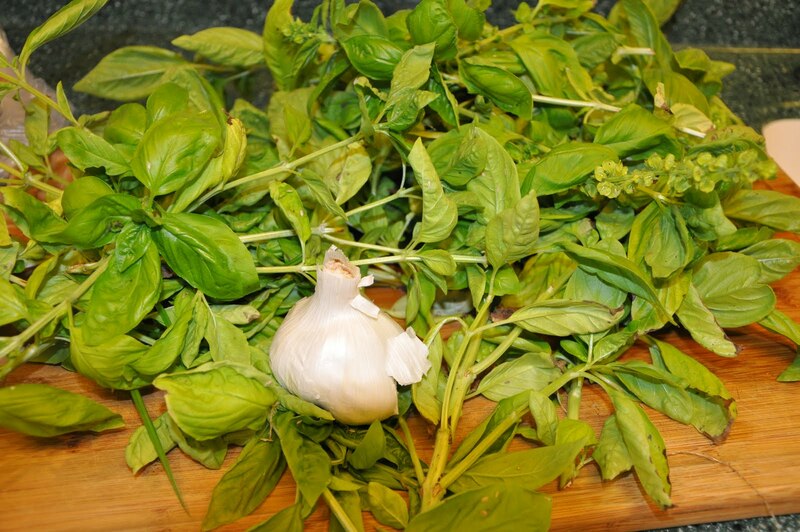 I am going to make two of my favorites…”pesto” and “pesto butter”. In a bowl of a food processor, place the garlic (you can remove the skins by slightly tapping the garlic cloves with the wide part of a chef’s knife, garlic will come right out of the cloves) and toasted pignoli nuts. Process until a paste its formed. Add basil and parmesan and process until well chopped, slowly add extra virgin olive oil until well blended. If not using immediately, place pesto in zip lock bags, date and freeze. * To toast pignoli nuts place in a preheated non stick skillet and toast until slightly golden. 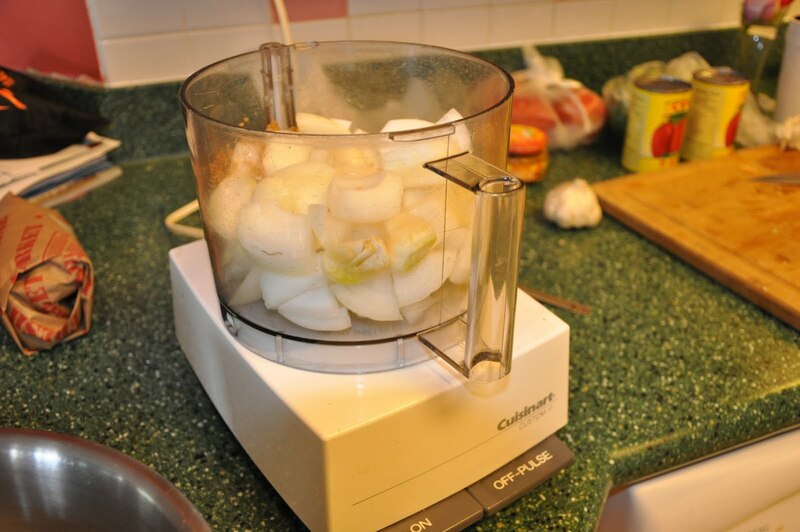 In a bowl of a food processor, place the garlic (you can remove the skins by slightly tapping the garlic cloves with the wide part of a chef’s knife, garlic will come right out of the cloves). Process until finely chopped. Add basil and process until well combined. Add butter and continue to process until blended. 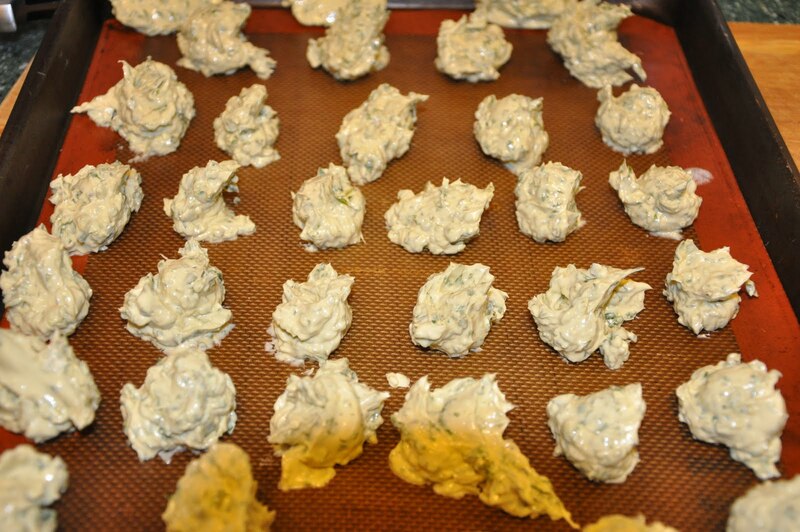 Using a small scoop place the pesto butter on a cookie sheet and place in the freezer. 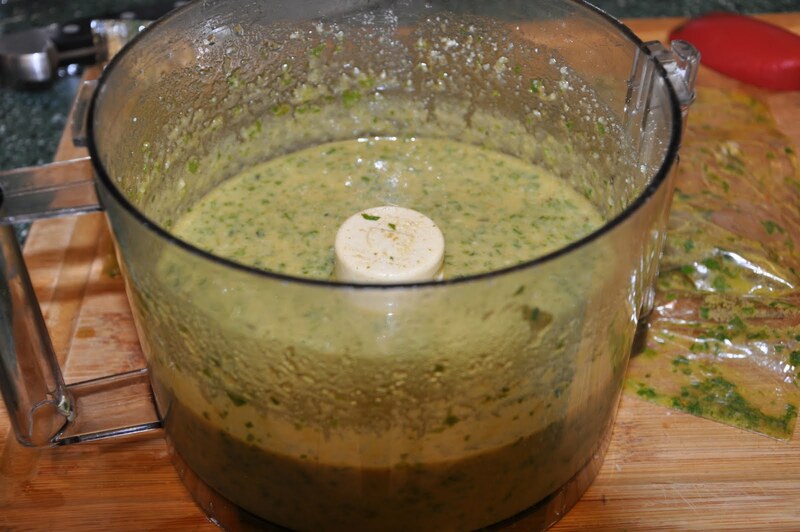 Once the pesto butter is frozen, place in a zip lock bag and date….this can be used for garlic bread, sauces and soups….recipes to follow. 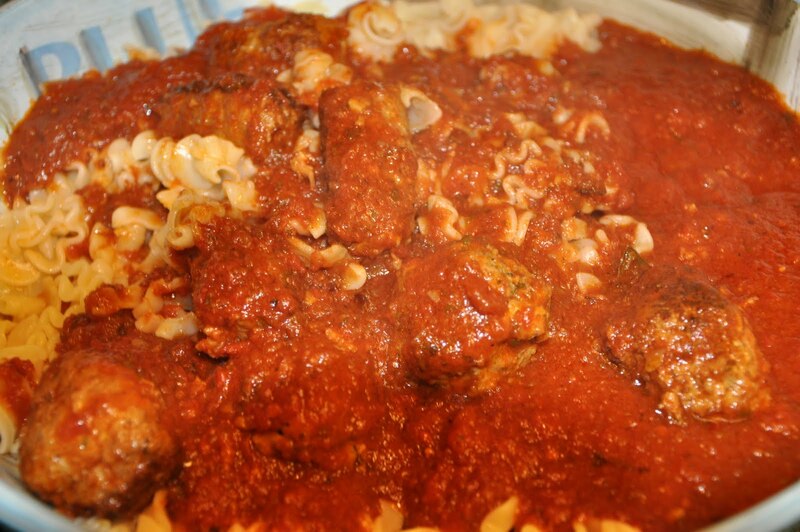 One of the biggest requests that I have from family and friends is “how do you make your sauce and meatballs?”…..read on…. I have wonderful memories of creating homemade pasta sauce, I hate to tell people that my family has NEVER had store bought jar sauce!!!! 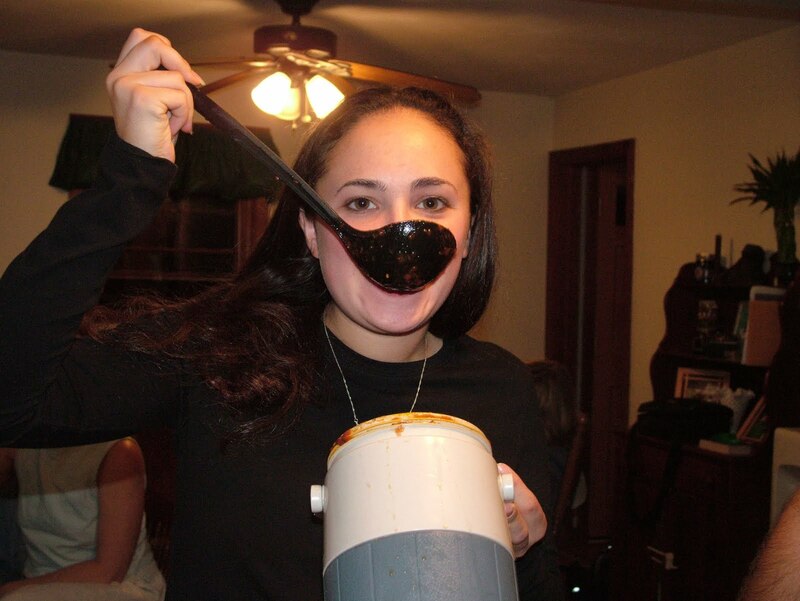 When my son, Rob, was little, he LOVED drinking my homemade sauce from a coffee cup…he could sneak into the kitchen when he thought no one was looking and help himself to cup after cup…..
My niece, Tiffany, is another lover of my sauce ‘n’ balls (as she calls it)…after moving to TN from CT, when I would visit her I would bring her some sauce. She would take the container and hide in another part of the house devouring the contents of the container…so funny, she would not share it with anyone!!!! 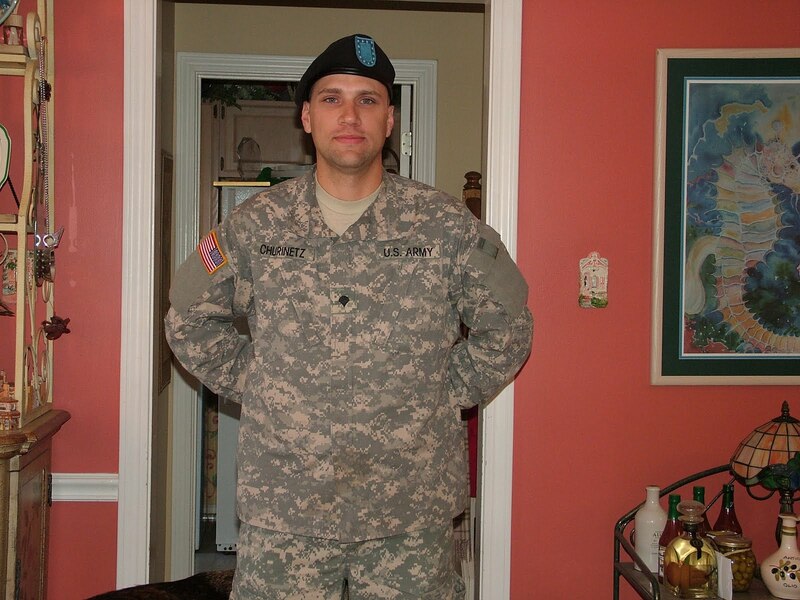 Yes, lots of GREAT memories, the smell of the sauce…yum… Rob is now in the Army, stationed in Fort Hood, TX….he’ll be home for a visit in a few weeks. So, I thought I would make a BIG batch of “sauce ‘n’ balls” for him to take back to Ft. Hood when he comes home…that will be a nice surprise for him…..
Below you will find step by step instructions for making your own homemade “sauce ‘n balls”…of course homemade sauce is ALWAYS best if you are able to “can” your own tomatoes, (see below video “how to can tomatoes”), however, in a pinch I recommend “Pomi” brand, they are in a box and do not have the “metallic” taste of the other brands…..
For the meatballs you will need, 1 1/2 lb. ground round, 1/2 lb. ground pork, 3 eggs, 1 chopped onion, minced garlic, Italian flavored bread crumbs, fresh parsley, milk, basil, oregano, grated parmesan cheese, red pepper flakes, black pepper, salt, and fennel seeds…. (yes)…for the sauce you will need extra virgin olive oil, bacon, chopped onions, garlic, red italian wine, tomatoes, tomato paste, fresh parsley, basil, oregano, bay leaves, red pepper flakes, black pepper and fennel seeds.First, pre-heat a large stockpot. Add 1/4 cup extra virgin olive oil. 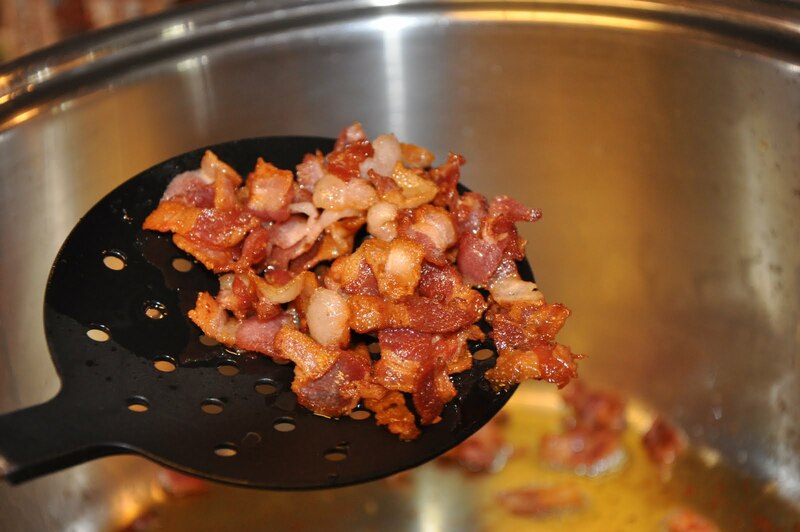 Once the oil is heated, add 1/4 cup chopped bacon. Cook the bacon over medium heat until nice and crunchy. Once cooked, remove from the pan. In a large mixing bowl, add 1 cup of the chopped onion/garlic mixture, ground round, ground pork, 1/2 to 1 cup Italian flavored bread crumbs, 1/4 cup chopped parsley, 1/4 cup grated parmesan cheese, 3 eggs, 1/3 cup milk, 1 teaspoon oregano, 1-2 teaspoons basil, 2 teaspoons crushed fennel seeds (a coffee grinder is best) red pepper flakes to taste, ground black pepper, and salt to taste. Mix ingredient until thoroughly combined, but do not over-mix. 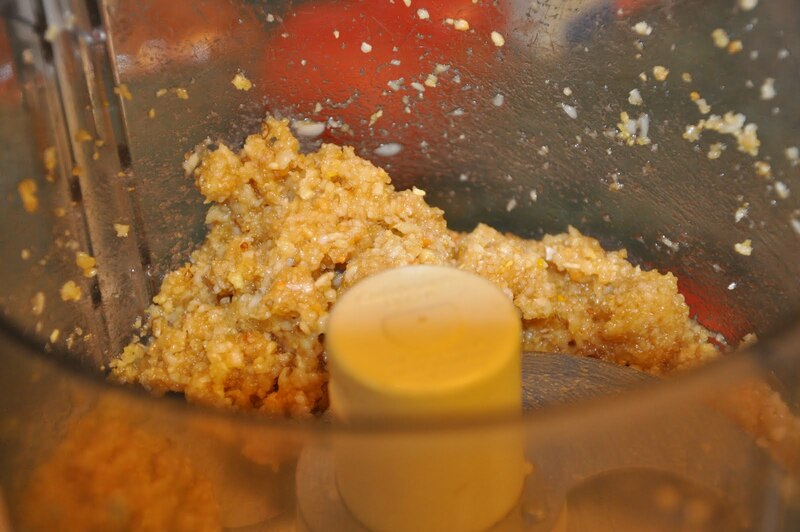 If the mixture is too thin, add additional breadcrumbs; too dry, add additional milk. Roll into a 1 1/2″ diameter ball. If you have the right consistency the ball should hold together without deforming when placed in the hot oil. 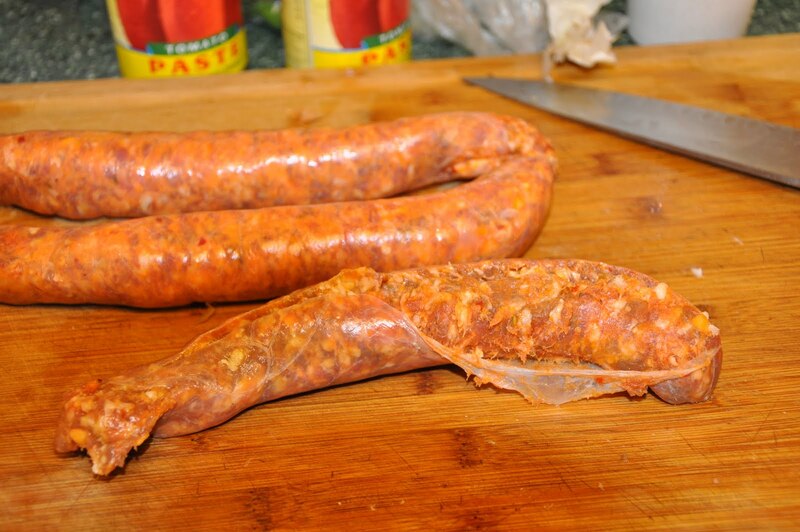 Add 2 pounds hot Italian sausage, skin removed, cut into 3″ pieces, into the hot bacon grease. Brown on all sides. Remove from the saucepan. Add meatballs, in small batches without overcrowding the pan. Brown meatballs on all sides and remove from the saucepan. Add remaining onion/garlic mixture to the pan drippings and cook until soft and transparent, about 5-10 minutes. Deglaze pan with 1 cup of red wine…Simmer 5 minutes; add 7 quarts tomatoes, 2 cans tomato paste, 1/3 cup chopped fresh parsley, 1 tablespoon oregano, 2 tablespoons basil, 1 tablespoon crushed fennel seeds, 1/2 teaspoon red pepper flakes, 1 teaspoon black pepper, 4-5 bay leaves and cooked bacon. Stir until well combined. Let sauce simmer, uncovered, 2-4 hours, or until thick. Add meatballs and sausage and continue to simmer an additional 30 minutes. 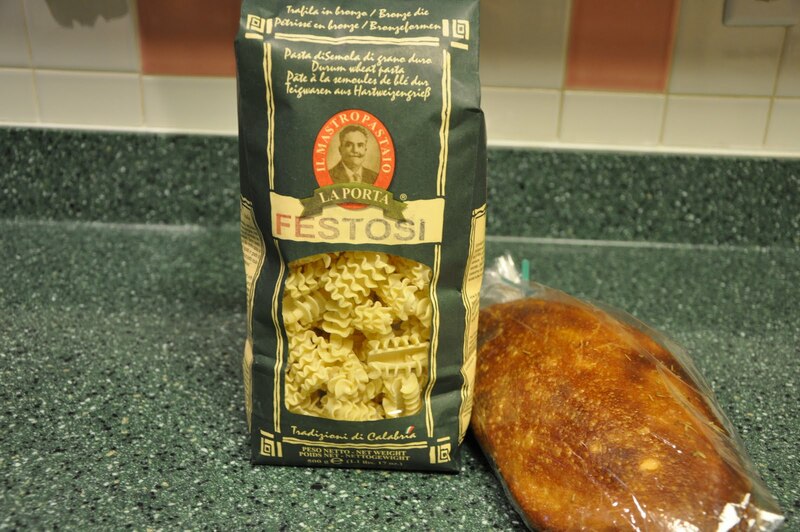 Serve over GOOD Italian cooked pasta and sprinkle with well aged Parmesan Reggiano cheese. This recipe will make enough sauce for 7-8 meals for four. Freeze sauce for up to 6 months. Want to know how you can tell the difference between Parsley & Cilantro and which kitchen tool removes the herbs, check out my video with Guy Fieri…. One of my all time favorite dishes, Lobster in Puttanesca Sauce!!! Bring a large pot of water to a boil over medium heat and season the water with salt. Cut the lobster tails lengthwise, remove the meat from the shells and chop into 1-inch pieces. Pit and chop kalamata olives and rinse the capers. Set aside. Heat a large saute pan over medium-low heat. Add the olive oil and heat through. Add the shallots and cook until soft, about 3 to 4 minutes. Stir in the garlic, anchovy paste, and red pepper flakes and saute for an additional 30 seconds; do not brown the garlic. Add the tomatoes, wine, chicken stock, basil and parsley. Simmer for 15 to 20 minutes. Add the capellini to the boiling water. 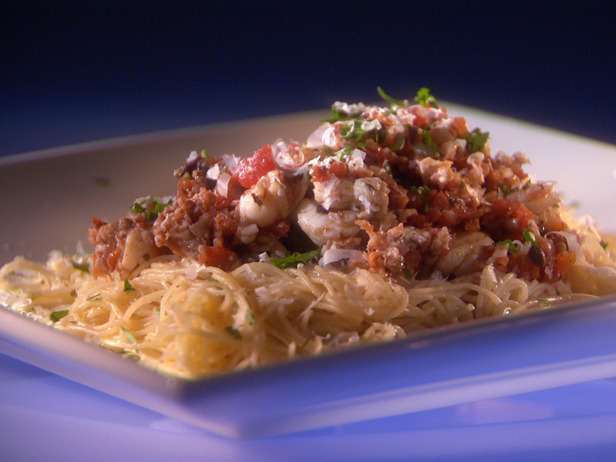 Stir the chopped lobster meat, capers, kalamata olives, butter, and pepper, to taste, to the tomato mixture. Cover the pan and simmer the sauce until the lobster meat is cooked, about 5 to 7 minutes. When the pasta is cooked, drain and add to a serving bowl. Pour the sauce over the pasta and toss. Sprinkle with grated Parmigiano-Reggiano and the chopped parsley and serve. ¼ tsp. poultry seasonCombine all ingredients in a large plastic bag and set aside. 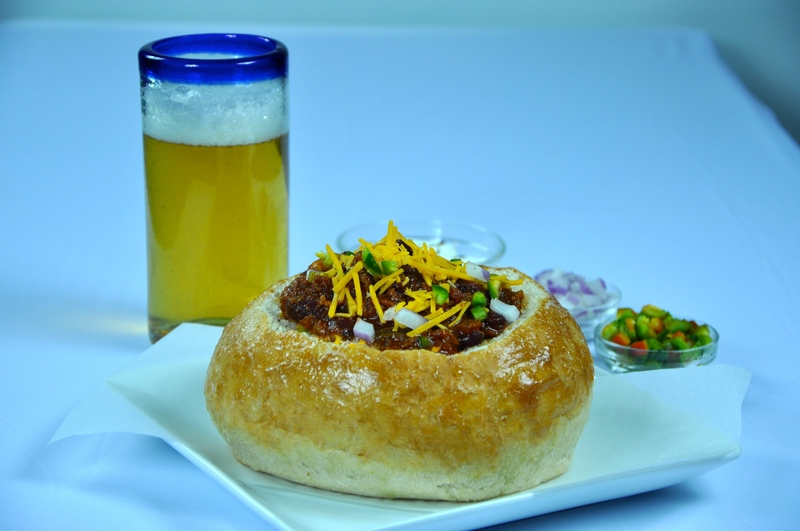 Combine egg yolk and beer in a medium size bowl, gradually add remaining ingredients mixing well. Heat oil in a large skillet to 375 degrees, or medium high heat. Dredge chicken pieces in seasoned flour, crispy batter and then back into the seasoned flour. Place in hot oil and cook covered for about 20 minutes, turn pieces and cook an additional 20 minutes or until golden brown on all sides and an internal temperature of 160 degrees has been reached with a meat thermometer. Drain a rack, or place in a 200 degree oven to keep warm. Viking, September 20th, only 2 seats left….call and reserve yours to find out the real way of making the “best pizza in Memphis”…..
How To Can Tomatoes……it’s that season…don’t know what to do with the fruits of your garden, check out my video…..
love my jobs!!!!! 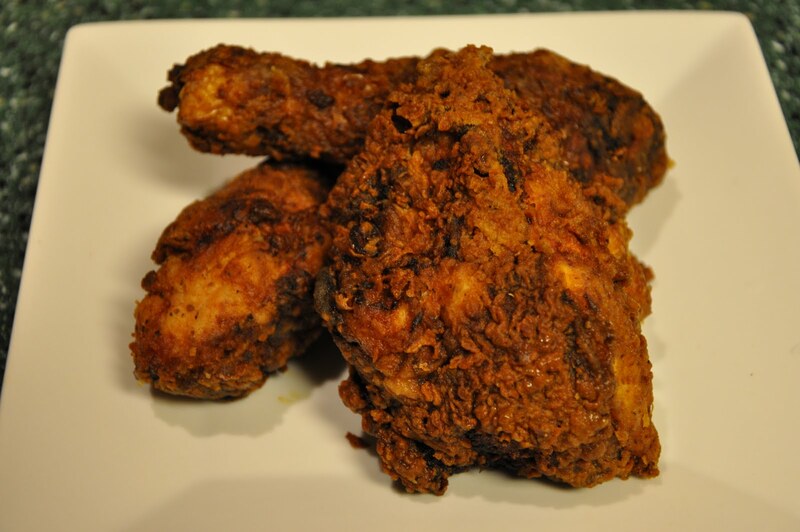 The people make them sooo sooo special…the ultimate “fried chicken”…ummmm..never thought I would say this but “slow cooked Southern Greens”…omg…yum…how can you possibly go wrong with 1/2 lb. 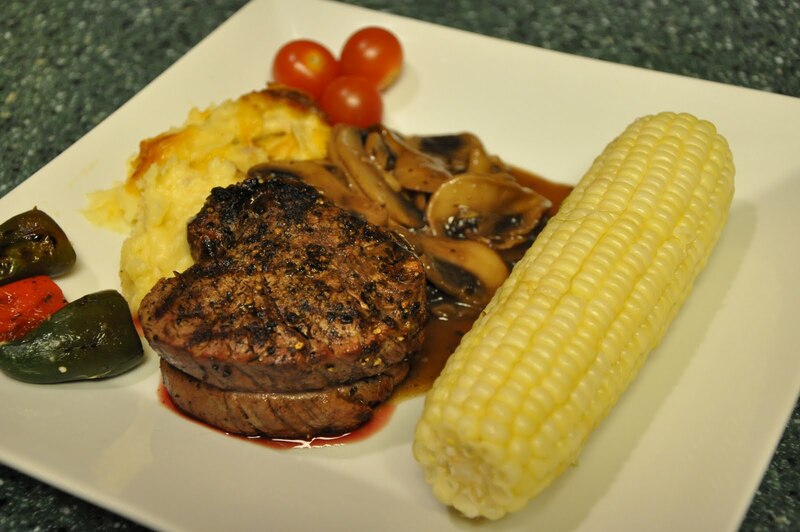 bacon…wow….good home cooking comfort food…recipes to follow…. 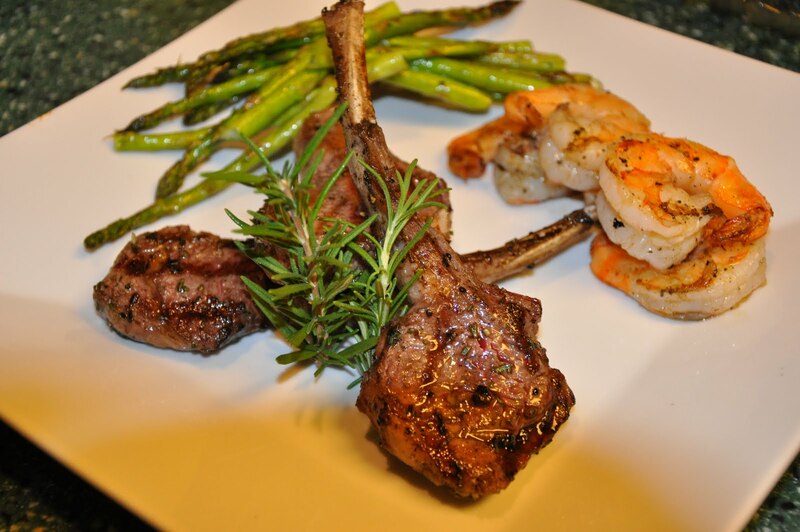 So last night I made “Marinated Grilled Lollipop Lamb Chops”, Shrimp, Grilled Asparagus, and served this with Sunday night’s left over potatoes….Sunday night was “Grilled Steaks, Roasted Garlic Red Skin Mashed Potato Bake, Grilled Corn, Grilled Jalapenos and Sauteed Mushrooms in a Red Wine Reduction Sauce…interested in the recipes????? Check back later….Busy day, consulting at ACH Food Companies and then teaching “Southern Cooking”…lol…the “damn yankee” teaching Southern Cooking, ya gotta love it!!! Have a GREAT day everyone!!!! 2-3 tablespoons manzanilla olives, coarsely choppedWish together the oil, vinegar, green onions, shallots, garlic and cumin seeds; season to taste with salt and pepper. Add the bay leaf and set aside until needed. Arrange the cheese slices in an attractive serving dish; top with the roasted peppers and chopped olives. Pour the marinade over the peppers, cover and refrigerator overnight, or up to four days before serving. Let stand at room temperature at least 1 hour before serving. 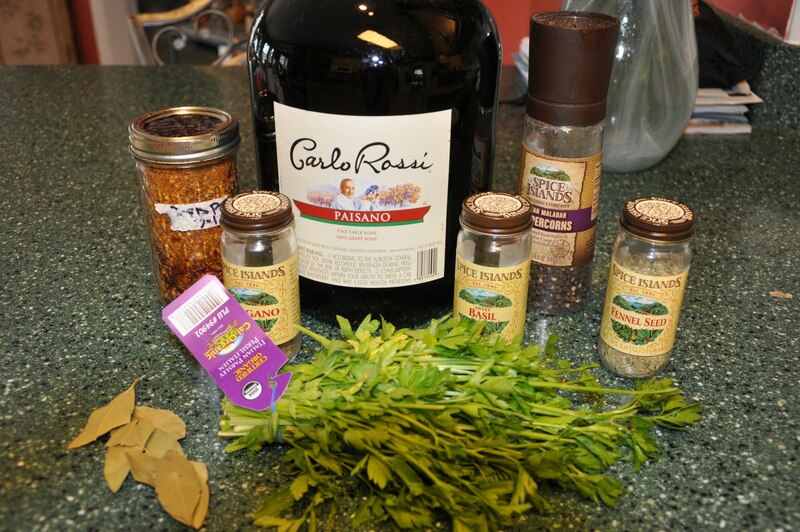 (Remove the bay leaf) Garnish with chopped fresh parsley (optional). *To toast the cumin seeds, heat a small sauté pan over medium heat; add the cumin seeds and cook, stirring constantly, until the aroma is released and the seeds just begin to brown. **To roast the pepper, char the pepper over a gas flame on the stove or a broiler, turning to ensure the skin blisters evenly. Place the roasted red pepper in a small bowl and cover with plastic wrap until cool. Peel the dark skin and remove the seeds, do not rinse under water. It’s that glorious time of the year when so many of us “foodies” are gathering the goodies from our garden….this is one of my favorite recipes…I hope you enjoy it as well….let me know! Make it quick and easy by using store bought pie crust and canned diced tomatoes! In food processor with knife blade process butter and basil leaves until smooth. Add flour, salt and sour cream. Process until mixture balls up. Chill for 1/2 hour for better handling of the dough. Place on floured pastry sheet or board and roll out to fit a 9” pie pan. Place shield or wrap edges in foil to prevent over browning during the baking of the pie. Cook in pre-heated 425 oven until slightly golden, about 10 minutes. 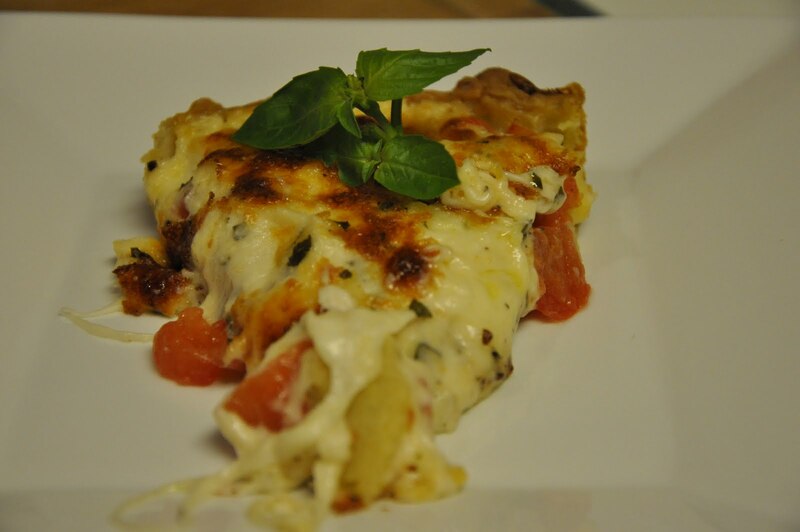 While pie crust is warm, place 1 cup mozzarella on top of crust. Layer tomatoes and sprinkle with, salt & pepper. In separate bowl mix basil, garlic, 1 cup mozzarella, romano cheese and mayonnaise. 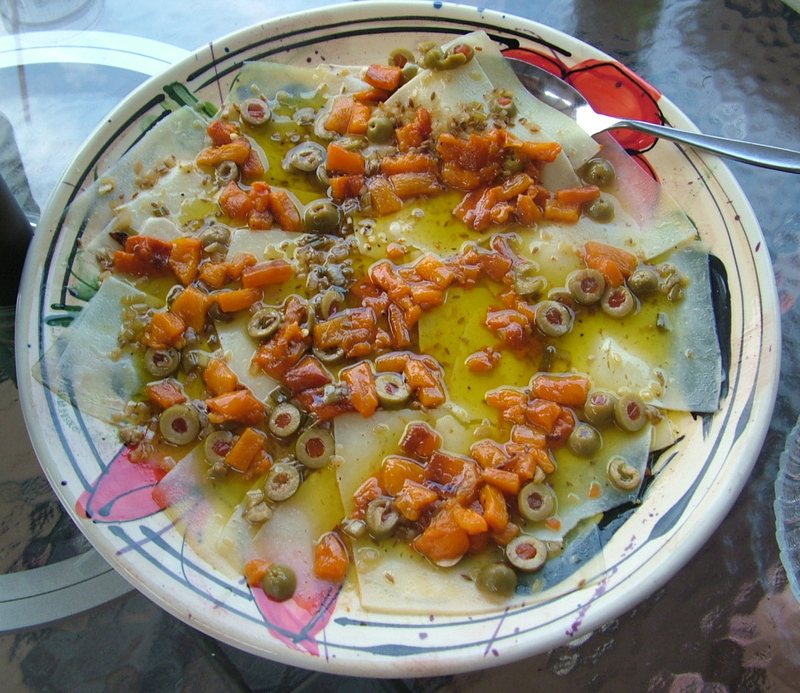 Place on top of the tomatoes and drizzle with olive oil. Bake at 375 for 30-40 minutes or until golden. Let pie cool about 15 minutes before cutting. *Cut an X on the bottom (pointy end) of the tomato and place in a pot of rapidly boiling water. The tomato skin will begin to unpeel itself, about 1 minute. Remove from heat and place under cold running water to prevent the tomato from cooking. This entry was posted in Cheese, Steaks/Beef. Bookmark the permalink.